When you get the idea of being controversial in your writing, remember this can be adapted for both blogging and commenting. This idea is to draw attention to yourself, your blog and/or your business. But you know you need to be careful. Being controversial isn't a quick fix, or to be taken lightly. What is the purpose of being controversial? First of all, you need to know what your goals are for being controversial. It isn't just a matter of being contraire, stating an alternative point of view, or being annoying. Are you doing this to get noticed? Would you like to get a particular point across? Are you educating your public in something they ought to know about? Or are you just putting the world to rights? Whatever you choose to do, always have a logical outcome in your sights. A proper purpose will help when you are challenged or berated, as you will know where you stand. This will not only inspire you to write the post, or leave a comment, it will give you the power and courage to have your say. However, regardless of how forceful your thoughts are on this particular topic, take time to stand back and be guarded in your language. Be aware of which words could upset your readers. You may want them to get riled up, but not to an extent that what you write about may backfire on you. We are lucky we live in a world of free speech, and are able to take advantage of this. But there are ways in which we can say what we mean, and show how passionate we are, without unnecessarily alienating ourselves from our audience. If you want to consider being controversial in your posts and comments, it's best to really know about your subject before you begin. People who mindlessly chanter on about stuff just to make an impact are both infuriating and obnoxious. It's best to avoid being seen as this. It's a good idea to do some research before you start writing. And if you're commenting, weigh up the pros and cons and how they affect the original post and other comments before you start. Give yourself a good base to work from, so you can present your argument well. Remember even what you consider as a trivial topic, others will have a different view and will have very strong opinions about it. You just won't know how they will relate and react to what you write. If you are going to assert yourself on a particular subject, it is essential you know all the facts before you start writing. Otherwise if anyone opposing what you say can produce material that disclaims or makes you look stupid, you will not be in a strong place. If you want to succeed with being controversial, you need to do adequate research for accurate sources and data for evidence to back up your arguments. This is particularly so if you are focusing on a touchy subject that could result in some passionate outbursts. This kind of controversial writing or commenting will stimulate a lot of discussion, and not necessarily in agreement with you. However, to stand your ground, prior preparation of the inside information will help you save face. Sometimes it can be something very trivial that gets a response. You may not even know what you have written that gets someone's back up. It's a good idea to analyse any strong reactions you get, so you can do something about it. Obviously using inflammatory language or belittling a particular person or subject will excite your audience's anger. But is this what you want? Being controversial is not about alienating yourself with your readers, it's more about stimulating others to have their say in return. A good tip to create more interest is to search for timely material that is currently trending and is relevant to your niche. The former is what people are interested in, and the latter won't confuse your existing readers and drive them away. Before you take on a controversial subject, it's a good idea to have studied as many alternative views as possible before making your own. This will make what you have to say more considered, measured and readable, as well as help towards presenting a valid argument. Tackle the subject boldly, focus solely on the one key issue, and hold your opinion. Writing well will enable you to get your point of view across, exploring all sides whilst holding the common ground. However, remember not to turn your readers against you. Being controversial is about encouraging comments, and even negative ones can be worthy of publication if they start off a good discussion with other readers who may be on your side. 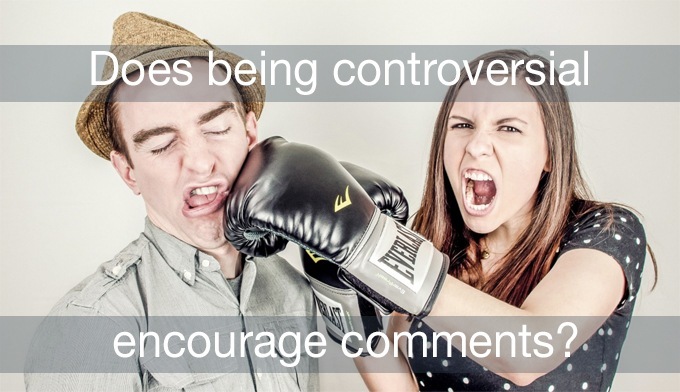 Anything controversial will result in negative comments. Some may not be very nice at all. Bloggers have the power to veto responses before publication, but on social media there is no moderation and seeing horrible comments can be very hurtful. However, if you are going down the route of being controversial, you have to manage the consequences. In today's world not everybody is sweetness and light. You will have to take it on the chin or get someone else who is not emotionally connected to help you deal with it. However, this doesn't mean you shouldn't publish negative comments or ignore opposing opinions. Contrary views make a discussion more interesting. It can encourage readers who previously may not be riled up enough to have their say. The last thing you want to end up is to upset your existing readers in the expense of getting new ones. That is like biting off your nose to save your face. And if you are commenting on another blog, you certainly don't want to annoy its owner. After all, you want your comments to get published, don't you? The four main traits for being controversial is to be tactful, polite, direct and honest. Wear your heart on your sleeve. Show your personality and make others relate to you, even if they don't agree with what you say. And remember never to let your bias on a topic get the better of you. Also never comment in anger. Curb your desire to say offensive or undermining things. You will not gain anything by forming unnecessary enemies, or by ending up being classified as a troll. If you are writing a controversial post, give yourself enough time to weigh up the pros and cons of doing so. Will this draw the right kind of attention to you that will make a difference? Are you going to attract the sort of reader you would like reading your blog? Commenting is accomplished within a shorter time-frame, and is usually done in the heat of the moment. This can be dangerous if you are fired up by another's point of view, and are desperate to counteract it. You could end up in hotter water than you expected or meant to be. Therefore it's worth taking time out before hitting publish. For posts, take a break and come back to it later. For comments, vent your anger elsewhere and return to it for severe editing before you submit it. Remember, once it's published, you cannot take it back. How does being controversial help you? You could aim to become an expert in being controversial. If you manage to do this correctly, your points of view may be sought to balance an argument or spice up an otherwise boring subject. You may even accrue a loyal following who expect you to be controversial every time. However, this can become very exhausting, and even exasperating if you are prevented from writing ordinary posts now and again. Or occasionally submitting a regular comment could disappoint the other commenters who have been girding their loins ready for a fight. So I suggest being controversial for select situations, and only when it suits you. One benefit is it will make you stand out above the competition. But you will want this to happen on your own terms and not to satisfy the whims of others. Share with us any stories or anecdotes you have had when you wrote a controversial post or submitted a controversial comment. What affect did it have and was it good or bad?